Mrs. A.C. van Gogh-Carbentus, Leiden. Mrs. A.C. van Houten-van Gogh, Dieren. Mrs. A.T. Scholte-van Houten, Lochem (until 1969). Heirs of Mrs. Scholte-van Houten, Oegstgeest. Anon. sale, Sotheby's, London, 3 July 1973, lot 62. J.-B. de la Faille, L'Oeuvre de Vincent van Gogh, Catalogue raisonn, Paris, 1928, no. 201. W. Vanbeselaere, De hollandsche periode in het werk van Vincent van Gogh, Antwerp, 1937, p. 416. J.-B. de la Faille, Vincent van Gogh, Paris, 1939, no. 218. J.-B. de la Faille, The Works of Vincent van Gogh: His Paintings and Drawings, Amsterdam, 1970, p. 180, no. F201. J. Hulsker, The Complete van Gogh: Paintings, Drawings, Sketches, New York, 1977, p. 249, no. 1139 (illustrated). Milan, Palazzo Reale, Vincent van Gogh Dipinti e disegni, February-April 1952, no. 60. Amsterdam, E.J. 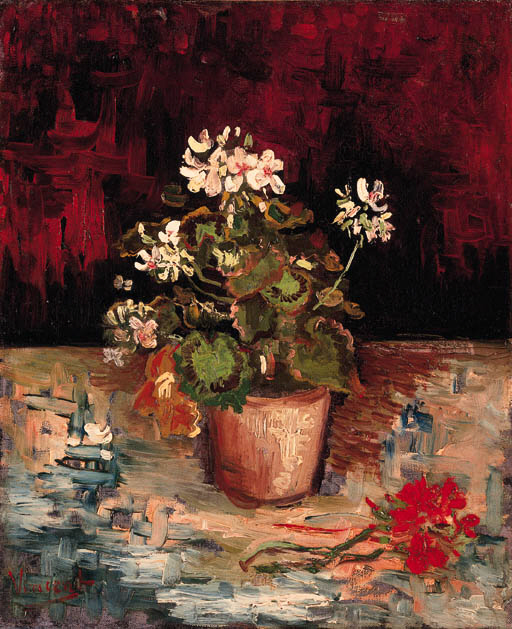 van Wisselingh & Co., Vincent van Gogh, Quelques oeuvres de l'poque 1881-1886, provenant de collections particulires nerlandaises, February-March 1956, no. 33. Munich, Kunsthaus, Vincent van Gogh, October-December 1956, no. 98. Essen, Villa Hgel, Vincent van Gogh Leben und Schaffen, Dokumentation, Gemlde, Zeichnungen, October-December 1957, no. 231. Paris, Muse Jacquemart-Andr, Vincent van Gogh, February-March 1960, no. 24. Warsaw, National Museum, Vincent van Gogh Paintings, drawings, etchings, October 1962, no. 93. Tel Aviv, Museum of Art, Helena Rubinstein Pavillion, and Haifa, Municipal Museum of Modern Art, Vincent van Gogh, January-March 1963, no. 58. Otterlo, Rijksmuseum Krller-Mller, on extended loan. And now for what regards what I myself have been doing, I have lacked money for paying models else I have had entirely given myself to figure paintings. But I have made a series of color studies in painting, simply flowers, red poppies, blue corn flowers and muyosotys, white and rose roses, yellow chrysanthemums--seeking oppositions of blue with orange, red and green, yellow and violet seeking les tones rompus et neutres to harmonize brutal extremes. Trying to render intense color not a grey harmony... So as we said at the time: in color seeking life the true drawing is modeling with colors... And so I am struggling for life and progress in art (LT459a).